Update 1: The link finally showed up in the App store. However, if you search NewsSnacker, it will not find it, but if you search twitter + news it finds it! Odd eh? Currently I have 5 news sources; however I may add a few more. Offer custom twitter lists for $1.99 a year. Basically you tell me what you want to see and I’ll code it up. 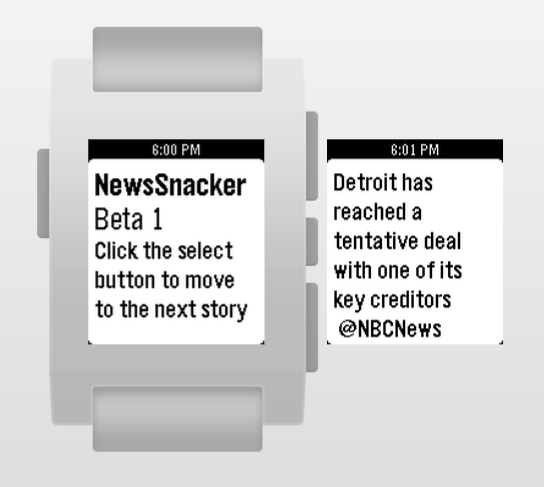 Tap on your watch and get the first ~300 words of the story. Expand to ~900 later. Click ‘save to read later’. Not sure how I will go about this yet.